(April 5): U.S. stocks ended weaker on Monday, pulling back from a recent rally that took them to new 2016 highs, as losses in commodity-related and industrial shares offset gains in healthcare. The S&P materials sector fell 1 percent after copper prices touched their lowest in a month, while energy shares slipped with oil prices. "What we're seeing is some classic bullish fatigue setting in. Oil and other commodities are all in pullback mode ... and investors are very focused on commodities because they led on the way up," said Adam Sarhan, chief executive of Sarhan Capital in New York. 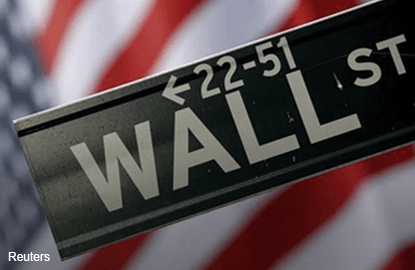 The Dow Jones industrial average closed down 55.75 points, or 0.31 percent, to 17,737, the S&P 500 lost 6.65 points, or 0.32 percent, to 2,066.13 and the Nasdaq Composite dropped 22.75 points, or 0.46 percent, to 4,891.80. Stocks have mostly gained since mid-February, recovering from deep losses thanks to stabilizing oil prices and reduced concerns about China's economy. Investors now await fresh news on the interest rate outlook following last week's encouraging data and Federal Reserve Chair Janet Yellen's cautious tone on raising rates. While the Fed's projections point to two rate hikes this year, traders expect only one, according to the CME Group's FedWatch program. General Electric, down 2.2 percent at $31.23, led a 1 percent decline in the industrials index. Shares of the medical device maker Edwards Lifesciences jumped 16.9 percent to $105.08 after a study showed a less-invasive heart-valve implant was superior to open surgery, prompting brokerages to raise their ratings on the stock. The stock boosted the healthcare index, which ended up 1 percent. Virgin America surged 41.7 percent to $55.11. The airline agreed to be bought by Alaska Air for about $2.60 billion. Alaska Air shares were down 3.8 percent. Volume was relatively light. About 6.4 billion shares changed hands on U.S. exchanges, below the 7.6 billion daily average for the past 20 trading days, according to Thomson Reuters data. Declining issues outnumbered advancing ones on the NYSE by 2,231 to 803, for a 2.78-to-1 ratio on the downside; on the Nasdaq, 1,684 issues fell and 1,133 advanced for a 1.49-to-1 ratio favoring decliners. The S&P 500 posted 57 new 52-week highs and no new lows; the Nasdaq recorded 65 new highs and 22 new lows.